LikeAlyzer makes social marketing on Facebook easier. This analysis tool helps you measure the success of your Facebook page and focuses on the important aspects (i.e. presence, dialogue, engagement). Just type in your Facebook URL to get your report. WizeHive is a collaboration tool that lets you build and use web-based apps to automate your business processes. You can share notes, tasks, ideas; manage projects and activities; and engage customers, employees, etc. 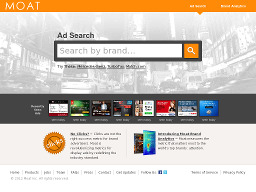 Moat An online ad search tool. The tool allows you to find and see the ads from a particular brand, discover new advertisers, or get inspiration from innovative creative campaigns. Simply type in the product name or brand and click the search icon to see its online ads. 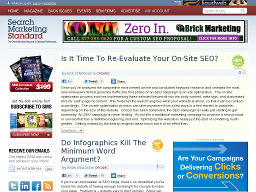 Search Marketing Standard A leading print publication covering the search marketing industry, including PPC advertising, SEO, and the latest trends in SEM. Linkalizer.com's Makes the webmaster's search for quality link exchanges easier. Quality is assured because every site is reviewed before acceptance into the Linkalizer program. Worth a visit if you you're looking for link partners. BrianSolis.com One of the web's leading business and marketing resources (ranked among the top 1% of all blogs tracked by Technorati). The blog provides articles on social media, current marketing trends and digital branding while defining the convergence of media and influence. 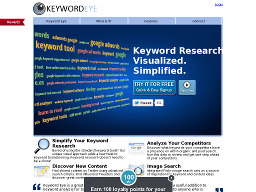 Keyword Eye An online, visual keyword research tool that can assist in PPC, SEO, blogging, content writing or marketing. Simply enter a keyword & the tool returns keyword ideas in a cloud format where search volume is indicated by the size of the keyword and competitiveness by color. Use the settings to edit the data and filter out irrelevant keywords. 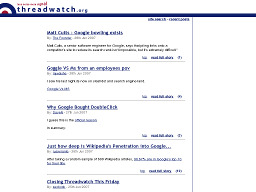 ThreadWatch.org A community website focused on Internet marketing and related technologies. A good site to find breaking news on topics of interest to webmasters and site owners. 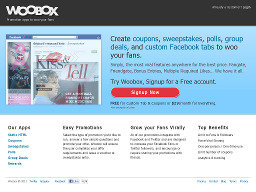 Woobox Helps grow your Facebook Fans or Twitter followers virally, and encourages or requires sharing your promotions with friends. You can setup sweepstakes, group deals, coupons, polls, etc. and use the sites analytics and tracking to check your results. 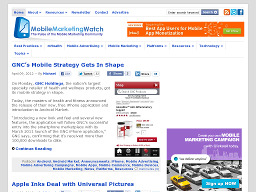 Mobile Marketing Watch A leading destination for timely news, resources, insight and industry commentary for the mobile marketing community. Resources include a Newsletter, Job Board, Whitepapers, Case Studies, Best Practices & Industry Guides, etc. 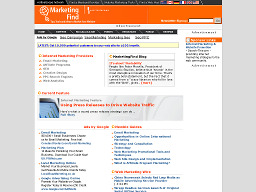 MarketingFind.com A Web marketing resource, combining reviews of emerging trends, in-depth analysis of industry participants and unique approaches for developing effective marketing strategies. 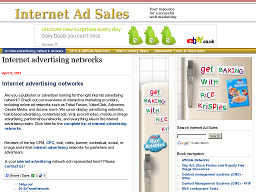 InternetAdSales.com A guide to profitability in the internet marketplace, providing an extensive directory of advertising networks as well as overviews of other revenue sources, a search engine directory, scripts, marketing, market research resources, and information and perspectives on industry trends. 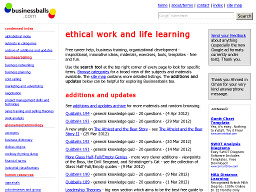 Businessballs.com An online guide that provides tips, examples, techniques, tools and a process for writing business plans to produce effective results. The marketing guide offers specific explanations, theories, tips on advertising, PR, copy-writing, Internet and website marketing, etc. MarketingVOX.com Keeps marketers and media professionals informed of important online marketing industry news. Links-Pal A categorized directory of high-quality websites that actively trade links. Basic submission and listing are free. Human editors review all submissions.